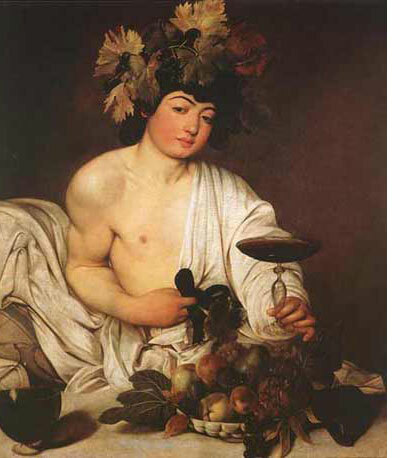 Dionysus or Dionysos is the Greek god of wine and he represents not only the intoxicating power of wine, but also its social and beneficial influences. He was also known as Bacchus. He is the patron deity of agriculture and the theatre. He was also known as the Liberator, freeing one from one's normal self, by madness, ecstasy, or wine. The divine mission of Dionysus was to mingle the music of the avlos and to bring an end to care and worry. In Greek mythology Dionysus was the son of Zeus and Semele and he is described as being womanly in appearance. Dionysus had an unusual birth that evokes the difficulty in fitting him into the Olympian pantheon. His mother was the daughter of Cadmus, a mortal woman and when Zeus' wife, Hera, heard that she was pregnant with a child of Zeus she was so jealous that she became Semele's friend disguised as an old lady or a nurse and when Semele confided in her that her husband was actually Zeus Hera pretended not to believe her and planted seeds of doubt in Semele's mind. Curious, Semele demanded of Zeus that he reveal himself in all his glory as proof of his godhood. Though Zeus begged her not to ask this, she persisted and he agreed. Mortals, however, cannot look upon a god without dying. He came to her wreathed in bolts of lightning and she perished in the ensuing blaze. Zeus rescued the fetal Dionysus, however, by sewing him into his testicles. A few months later, Dionysus was born. The name Dionysos is of uncertain significance. Nysa, for Greek writers, is either the nymph who nursed him or the mountain where he was attended by several nymphs, the Nysiads, who fed him and made him immortal as directed by Hermes or both. He had several children such as Aglaea, Euphrosyne, Thalia, Oenopion, Phthonus, Acis Deianeira and so on.